Home /BLM/USFS/Who or What Are Horse ‘Flippers’? The world of horse rescue is fraught with conundrums: what is rescue and how is it best facilitated? Who are the ’players’ involved and is there a way to tell the legitimate rescuers from those who represent themselves as having only the best of intentions — while their main goal is simply to capitalize on the suffering of equines? Those that haven’t been involved in rescue might find it difficult to imagine that the ‘community’ spirit surrounding equines and those that ‘care’ for them could be anything less than ‘benevolent’ but, in fact, there are vast numbers of people whose involvement in the various aspects of equine ‘management’ is driven only by financial gain. It is here that the ‘flippers’ live, work and conceal their true motives from all but their most trusted allies. It is here that horses are bought, sold, traded and even stolen. It is here that those vast numbers of unfortunates bound for slaughter are hidden from view, loaded onto trucks bound for Mexican and Canadian slaughter facilities where their meat — fit for neither human nor animal consumption — is procured via the most brutal methods imaginable. True to form, like thousands of other semi ‘illicit’ business that constantly toe the line between ‘legitimate’ and ‘illigitimate’ business practices and endeavors, theirs is often outside the boundaries of ‘legal’ enterprise. Horses, after all, can’t speak up on their own behalf and subsequently, remain at the ‘mercy’ of those in control — and in an environment of profoundly merciless actions and activities, anything akin to compassion is going to be found in gravely short supply. Such is the case with the ‘kill pens’ operating in the U.S. today. With an over abundance of horses brought about by overbreeding, ‘sale barns’ pick up millions of dollars by providing an easy means of ‘disposing’ of surplus livestock simply by shipping these animals across the borders to slaughter houses. These ‘slaughter pipeline’ facilities immediately came into being on the heels of a ban of equine and equid slaughter facilities that ere operational inside the U.S. until 2007 when Americans finally banned the practice. Unfortunately, operating under the Obama Administration, a small group of these individuals enjoying high level positions in government agencies worked together to create a lucrative option for themselves — one that would result in the brutal destruction of America’s horses and donkeys for profit. The fallout, for these amazing equines, has been horrific. Horses are routinely shipped to slaughter through no fault of their own. Mothers are ripped from their foals and tossed onto slaughter trucks leaving their babies to struggle and finally to die in the wake of such wholly unnecessary cruelty. 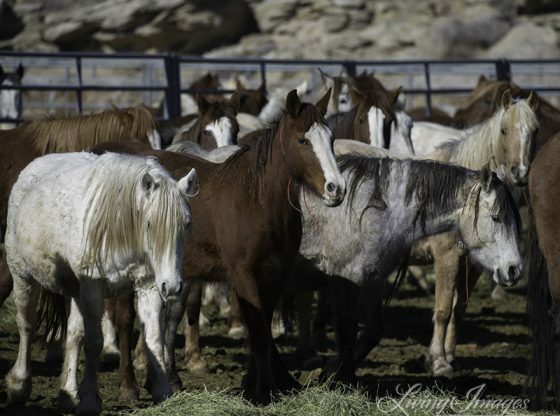 Wild horses are torn from their families — often generations strong — to stand broken and defeated in BLM pens, awaiting their ride to slaughter. Their babies are often run [using helicopters] until their fragile hooves finally disintegrate under the strain and they, too, await death isolated and alone, victims of policies devoid of even the most rudimentary tenants concerning regard for life. There is no reason for this level of disregard. America’s horses belong to Americans. There is enough land to sustain them and they are a natural resource needed to maintain the ecological balances ‘out there’ where they belong. The horrific fires burning out of control illustrate all too well the need for wild horses and donkeys that create ‘natural’ firebreaks and keep .